Over the years, Corsair has managed to carve a niche for itself as a purveyor of just about every PC gaming-related peripheral imaginable. 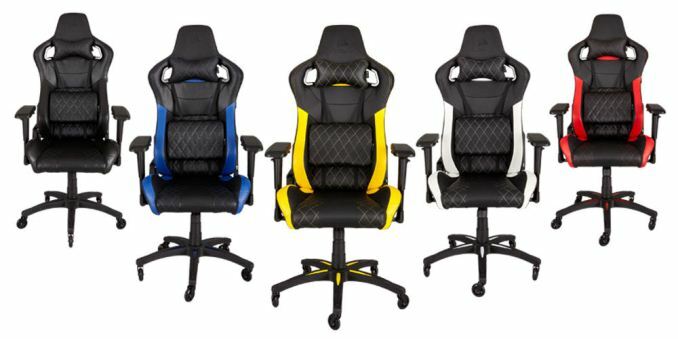 That product line expands a little more with the announcement of their first gaming chair, the T1 RACE. Said to be inspired by racing seats, and placing an emphasis on comfort and durability, this new model comes with a visual flair thanks to a choice of five different color accents. The T1 RACE is manufactured with a steel frame and dense foam cushions that are highly contoured, which should provide ample padding and support. Included are some removable neck and lumbar pillows to help during long gaming sessions. All the seating surfaces are covered in a synthetic PU leather, and as mentioned above there is a choice of either black, blue, red, white, and yellow accents and matching stitching. The textured armrests provide four levels of adjustment, and the user can move them up or down, left or right, forwards or backwards, or even swivel them to the most comfortable position. The T1 RACE features a powerful steel class 4 gas lift for height adjustments, while the seat itself tilts up to 10° and can recline up to 180°, which means that the user can lie completely flat. The chair itself sits on a five wheel base, and the caster wheels are made from nylon should ensure smooth movement and scratch protection on just about any floor surface. 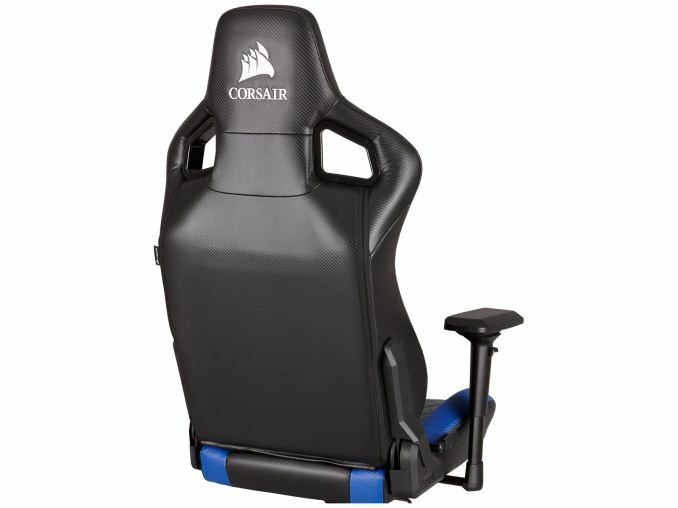 On the back of headrest is an embroidered and lightly embossed CORSAIR logo. The goal behind gaming chairs is one with many accessories: do you spend $60 on a gaming mouse, or a headset? Do you spend $110 on a gaming keyboard or gaming glasses? Do you spend $350 on a gaming monitor or a gaming chair? The accessories market is one element that gaming focused vendors like on tying users in to living and breathing a particular brand. 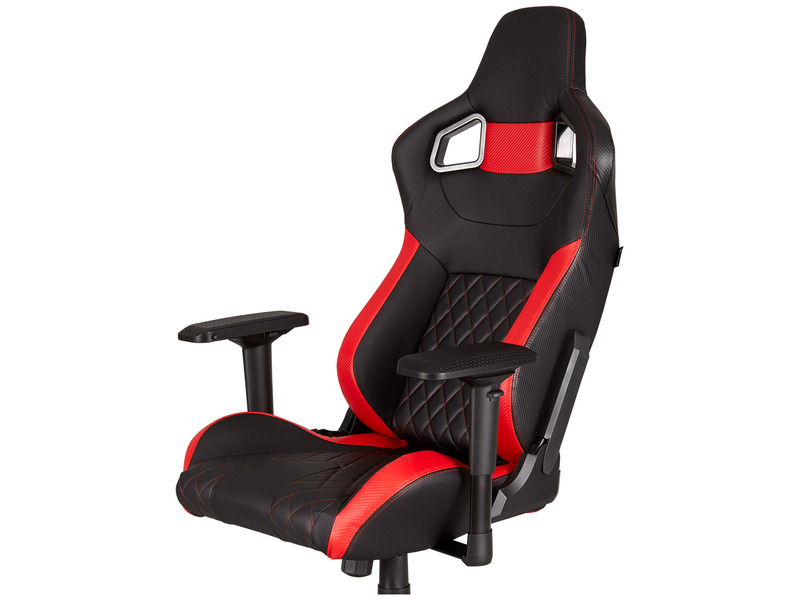 The T1 RACE Gaming Chair is available worldwide, and has a suggested retail price of $350 USD and a two-year warranty. I don't really see how it handle 500lbs and offer the reclining feature. I don't see any foot rest in the pictures so when it's reclined (completely flat) the center of gravity will tend to move outside the wheelbase... Unless there's a footrest that pops up to keep your legs horizontal also and balance it. Quality and features usually set chair price more than weight limit. Take a look from office chairs by SteelCase or Herman Miller, for example. What on earth do you hide into your chairs?